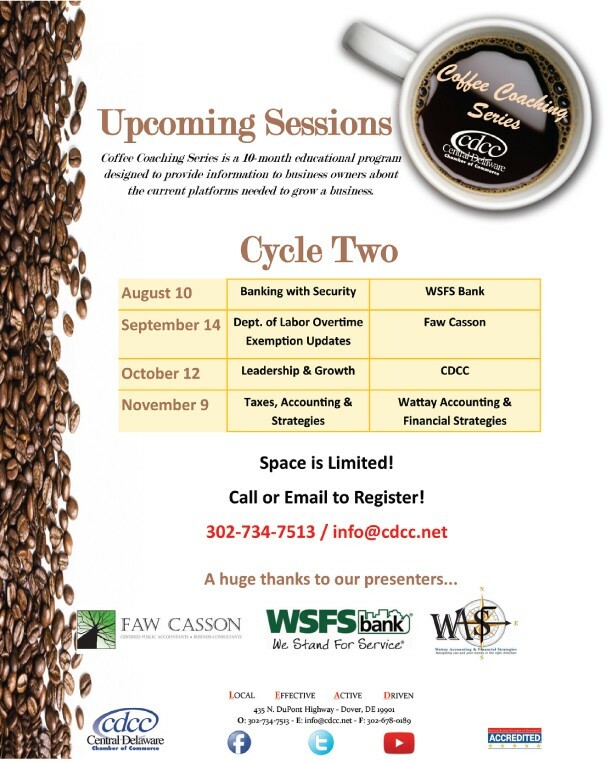 The Central Delaware Chamber of Commerce (CDCC) is excited to announce the second cycle of Coffee Coaching for the rest of 2016. With a break in July, the second cycle will pick back up on August 10th. From 8am-9am, attendees will listen to WSFS representatives talk about banking with security. September’s session will be presented by Faw Casson. Attendees will pack the CDCC Board Room on September 14th to hear about Department of Labor exemption updates. Like the other Coffee Coaching sessions, there will be 45 minutes of presentation with 15 minutes of networking and take-away discussions. On October 12th from 8am-9am, the CDCC will be sharing knowledge and insight on leadership and growth. Lastly, the second cycle will close on November 9th as Wattay Accounting & Financial Strategies provides education on taxes, accounting, and strategies. If you have any questions or want to register for either of these sessions call (302) 734-7513.